RUSSIA, EMPIRE. Ribbon for the Medal Commemorative of the Reign of Tsar Alexander III, Medal for Zealous Service, Medal for Zeal, Medal for Usefulness, Medal for the Emancipation of the Serfs of 1861, Insignia of Distinction of the Red Cross etc. 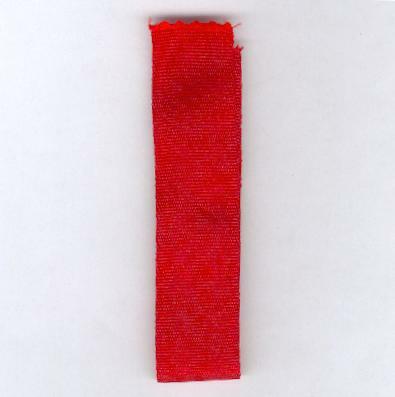 Length of ribbon of at least 15cm (6 inches). The ribbon is that for the following Imperial Russian awards: Medal Commemorative of the Reign of Tsar Alexander III, Medal for Zealous Service, Medal for Zeal, Medal for Usefulness, Medal for the Storming of Gandzha, Medal for the Turko-Egyptian war of 1833, Medal for the Emancipation of the Serfs of 1861, Medal for Agrarian Reform in Poland, Insignia of Distinction of the Red Cross, Medal for the Coronation of Tsar Alexander III, Red Cross Medal for the Russo-Japanese War of 1904-1905.